Researching boat companies to take us from Nassau to Exuma island to swim with pigs and sharks was exhausting. I came across a handful of highly rated and recommended tours, but the prices varied so dramatically from one to the next that I was kind of at a loss. The cheapest one (by far) I found was Powerboat Adventures – but it also offered the most in terms of activities, food and alcohol. It just didn’t add up – why would they cost half the price of their competitors? I was apprehensive of being scammed, or worse, being stuck on a touristy gimmick ride. Thankfully, I took my chances… because we had THE BEST DAY EVER!!! On Iguana Island, we were given a skewer stick and a handful of grapes as we filed off of the boats onto the white sand beach. The iguanas were accustomed to this feeding routine and happily took our grapes before scurrying back up to the rocks. We had just a few minutes here to swim in the crystal clear water before we were corralled back onto the boat. 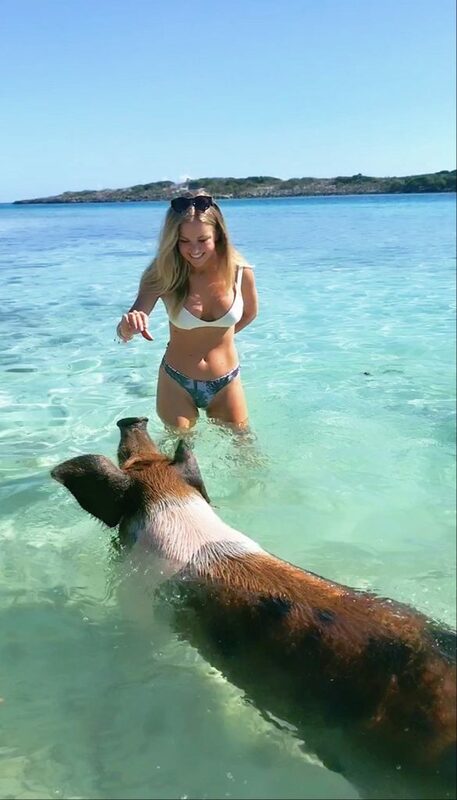 I assumed that pig island would be exactly the same: anchor, have 15 minutes for photos, then hop back on. ….so you can imagine how pleasantly surprised I was by how the rest of the day unfolded. We glided across the cerulean blue sea dotted with petite islands for a short 15 minutes before arriving to absolute paradise. As I hopped onto the dock, I happen to catch sight of a shark swimming just a few short feet underneath my feet. As I walked the wooden boardwalk, my eyes feasted on the sharks and stingrays dancing across the smooth ocean floor. It was the closest I’d ever been to a shark outside of an aquarium, and I was mesmerized by their gracefulness. On this idyllic island, the day was ours. The fully stocked complimentary bar was always open, the ocean warm and inviting, and lounge chairs just waiting to be relaxed in. If you wanted to participate in the activities, you were more than welcome, but if you preferred to soak up the sun from the comfort of the beach, or post up in the shade of the bar, well that was just fine too. Of course, everyone was quite eager to see the infamous pigs. We lined up waist deep in the water with apple slices in our hands and waited. 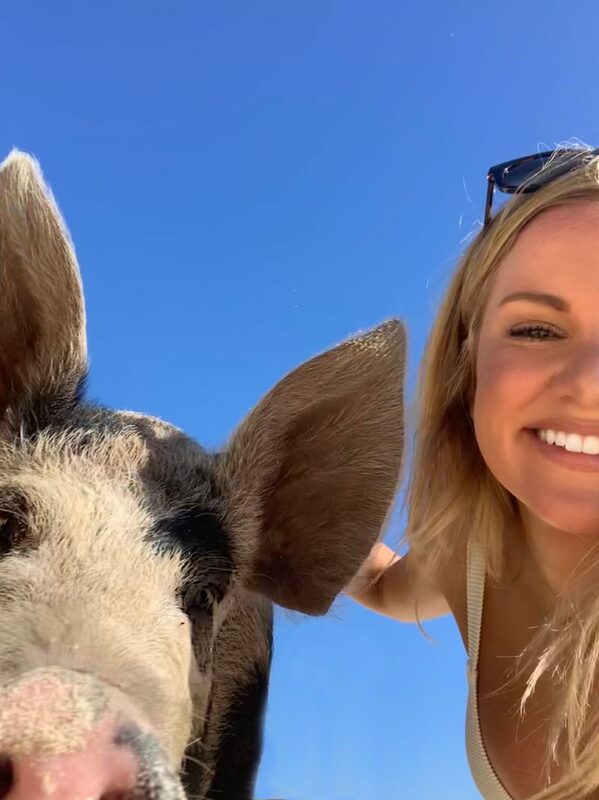 The pigs, which are cared for on the island, are kept in pens and treated like well-loved pups. 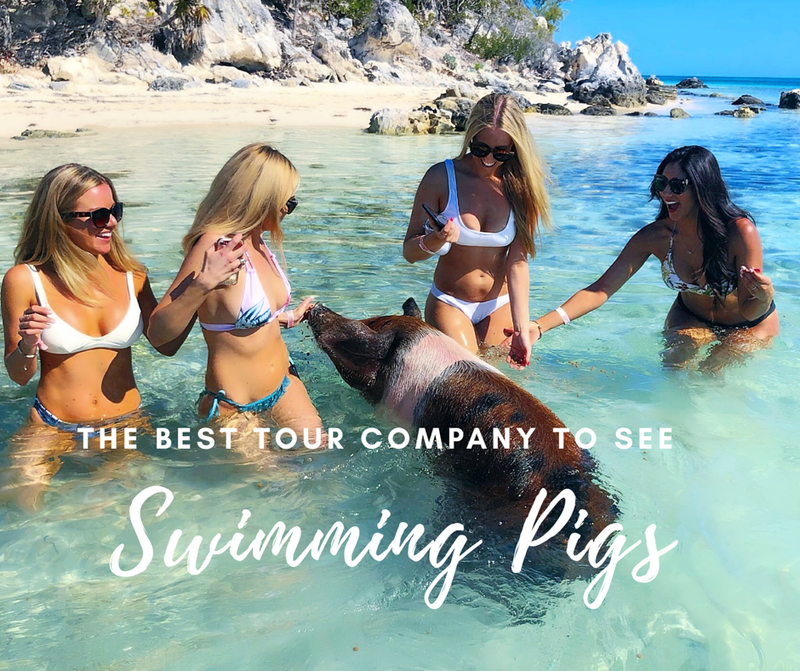 One could argue that this is an inauthentic experience, but I suspect that all of the ‘wild’ pigs throughout the Bahamas are in fact cared for. Regardless of them being ‘pets’, we were still a bit taken aback as they came charging towards us from the brush, snorting wildly. Some of the pigs were enormous, others just little babies, all of them frantically sniffing out the ground for food. After they finished up some scraps on the sand, the pigs were lured out to us to take the snacks right from our hands! They were friendly and sweet, and so stinkin cute. 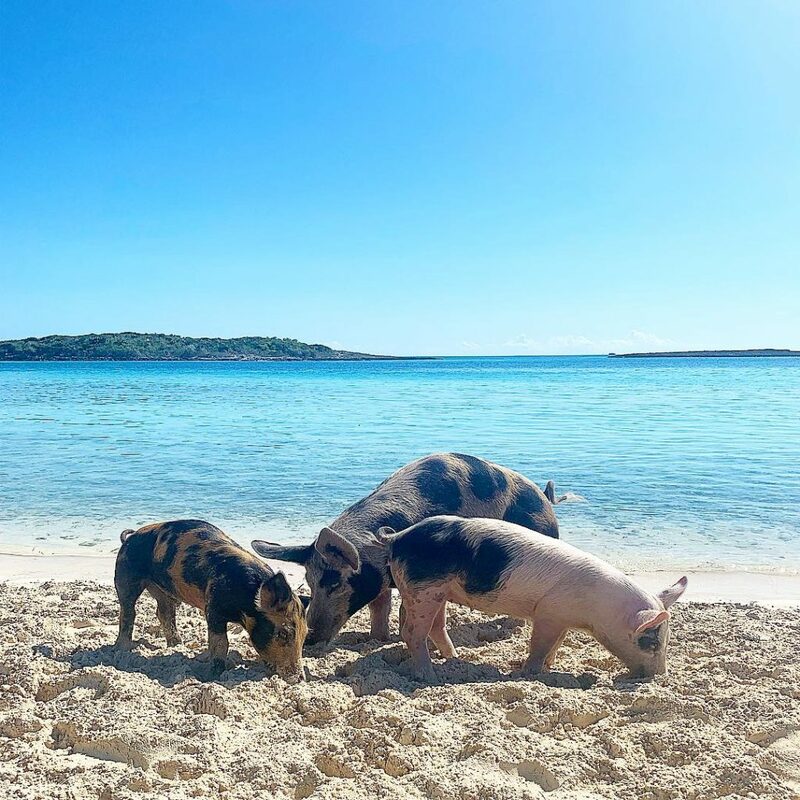 Anyone who says the pigs are aggressive didn’t go to the island Powerboat Adventures operates out of – because these guys were lovebugs. A million pictures later, and the pigs had ran back to their pens, squealing all the way. Anyone that was interested in feeding the stingrays lined up again, this time on our knees facing out to sea. 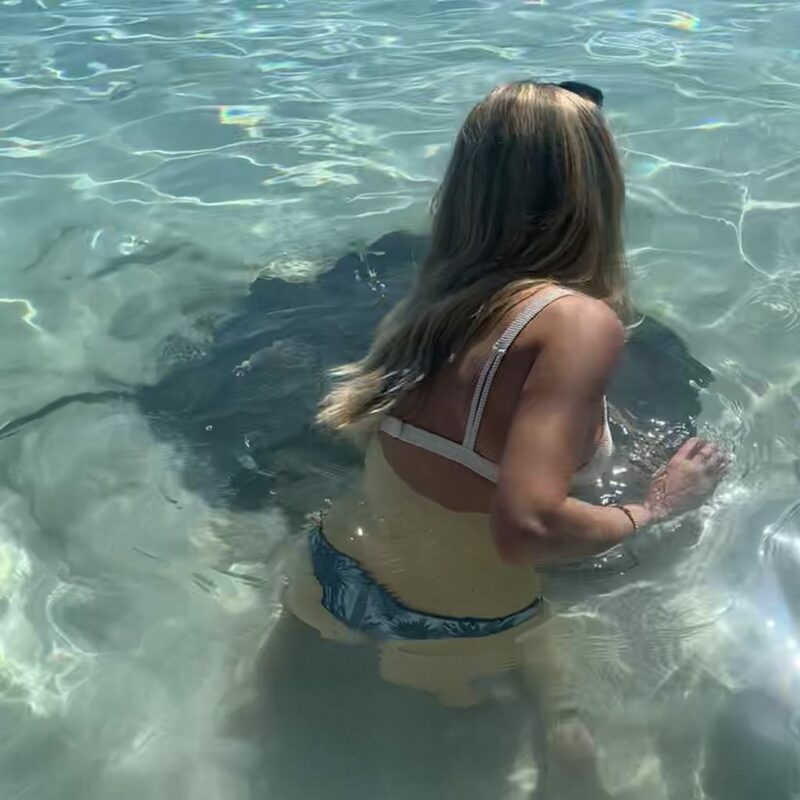 With a piece of raw fish between my peace fingers, the silky smooth stingray swam up and onto my thighs, grabbing the fish right from my fingers with his sharp spikey teeth. It was surreal. Now I was ready for another cocktail, so I met my friends at the bar while we watched the shark feedings. Big fish carcasses were thrown out into the water and dragged all the way to shore, the sharks following along curiously. Every so often, a shark would bite on and go for the ride into shore before letting go and swimming back out. After some liquid courage, I decided against my best interests to snorkel in the – LITERAL – shark-infested waters. The included snorkeling equipment was all new and clean with a variety of sizes. I dove into the refreshing water and swam above the coral, watching the tropical fish dart in and out and about. In the near distance, I kept a careful eye on the shark that loomed too close for comfort. After 30 minutes or so of blissful exploration of this foreign tropical world, I swam to shore to have lunch with my friends. By now, I was absolutely overwhelmed with everything that I had experienced. It had exceeded my expectations in such a miraculous way, that I truly felt like I was bursting with gratitude. 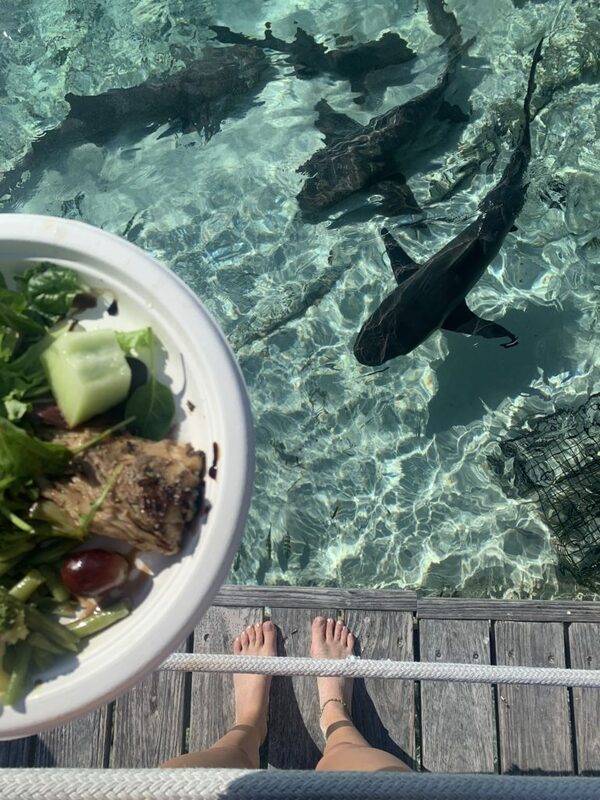 I ended up eating my plate of fresh salad, mahi mahi, and fruit alone on the dock, with my feet dangling just about the sharks swimming below – just trying to let it all sink in. After our satiating lunch, we laid out on the beach chairs with our cocktails, getting up every so often to dip into the ocean, or refill our drinks, until it was late afternoon and time to return home. So often when I travel I feel deeply moved by the places I encounter around the world. The fog rolling over Machu Picchu, looking up at the Sistine Chapel, bathing an elephant in the rivers of Chiang Mai. 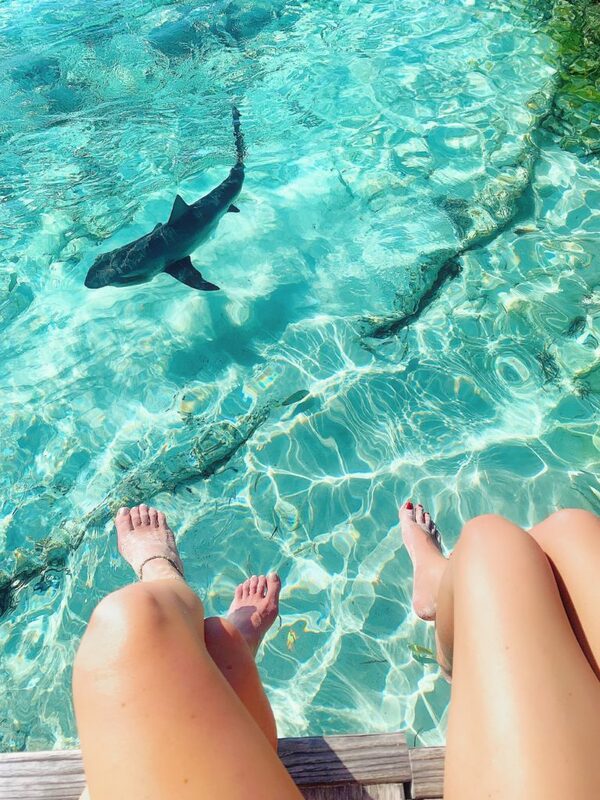 But, never in my life, would I have imagined that same sensation on a girls trip to the Bahamas. In conclusion, I’m shook. Our day included lunch, open bar, hotel pick up/drop off and the snorkeling equipment… all things that most companies didn’t provide…. and yet we paid half of what other tour companies quoted. I feel indebted to Powerboat Adventures, which is probably why I wrote them this love post. PS. keep scrolling for a really rough edited video I made of our Bahamas escapades. Disclaimer, don’t watch if you get motion sickness easily. Okay, that’s enough of me pouring my heart out to a boat company, if you want to read more on my recs in the Bahamas, click hurrr.